Face your fears head on! If you’ve had difficulty learning how to draw portraits of people in the past, fret no more. 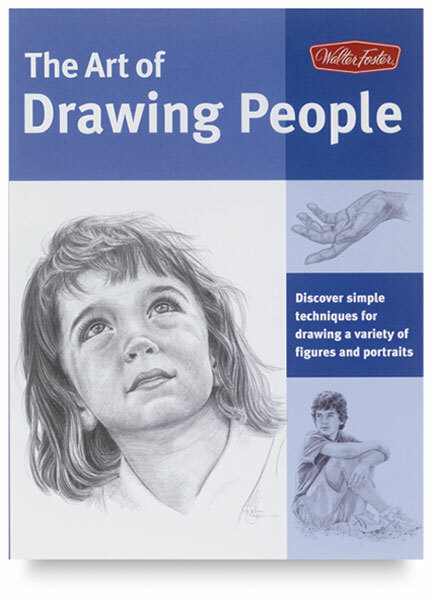 A popular title from the Walter Foster’s Collector’s series, The Art of Drawing People teaches even the most inexperienced artists how to draw accurate and realistic depictions of faces, features, and figures in graphite, with inspiration from four accomplished artists. Packed with practical advice, helpful tips, and fundamental techniques from four experienced artists, this comprehensive guidebook is an essential resource to which artists of all skill levels can refer again and again. The Art of Drawing People includes instruction in drawing the human head and clothed figure from infancy through old age in a variety of poses. The talented authors also share their knowledge about underlying anatomy, ethnic influences, and natural variations in shape, texture, and proportion, as well as basic information about drawing tools and pencil techniques. Debra Kauffman Yaun is a graduate of the Ringling School of Art and Design in Sarasota, Florida. She has worked as a fashion illustrator, and has drawn and painted many commissioned portraits. Her artwork has been published in numerous art magazines and books, and she has won numerous awards, including an international prize. Kauffman Yaun is a signature member of the Colored Pencil Society of America, having served as president of the Atlanta chapter, and she is a juried member of the Portrait Society of Atlanta. She also enjoys teaching classes and workshops in portraits and colored pencil. She lives in Buford, Georgia. Recognized as one of America’s foremost colorists, William F. Powell has taught art classes and workshops for 35 years in various art media. Today he is an extremely popular author, and attracts more admirers each year with the numerous titles he has produced for Walter Foster Publishing, including the Color Mixing Recipes books, which he conceptualized, designed, and illustrated. Ken Goldman teaches portrait, figure, and landscape painting at the Athenaeum School of Fine Art in La Jolla, California. He studied figure drawing and painting at the New York Studio School, National Academy of Design, and Art Students League in New York. He also studied portraiture and figure drawing with Vern Wilson of the Los Angeles Art Center, and watercolor painting with Liane Collot D’Herbois in Europe. Goldman’s art has been exhibited extensively and it has appeared in numerous magazines. Walter T. Foster was born in Woodland Park, Colorado, in 1891. In his younger years, he worked as a sign painter and a hog medicine salesman. He also performed in a singing and vaudeville act. Foster invented the first postage stamp vending machine and drew political caricatures for several large newspapers. He’s well known as an accomplished artist, art instructor, and art collector. In the 1920s, while running his own advertising agency and instructing young artists, Foster began writing self-help art instruction books. The books were first produced in his home in Laguna Beach, California, where he wrote, illustrated, and printed them himself. In the 1960s, as the product line grew, he moved the operation to a commercial facility, which allowed him to expand the company and achieve worldwide distribution. Foster passed away in 1981, but he is fondly remembered for his warmth, dedication, and unique instruction books. Authors — Debra Kauffman Yaun, William F. Powell, Ken Goldman, and Walter T. Foster.